Each and everyone of us experiences different sorts of environmental and social interactions. Some of these differences in external experiences are based on the different culture groups that we each belong to. Evidence suggests that there are culture-related differences in cognitive processing styles across individuals from different people groups. For example, it has been shown that Westerners engage more analytic processing styles involving greater attention to object features whereas East Asians engage more holistic processing styles involving greater attention to contextual information. The implication of these findings is that neurocognitive trajectories over the lifespan are not immutable, but are malleable to external experiences. As such, the interaction between culture-based influences and biological-based factors are important considerations for understanding how the brain works and for developing interventions that are beneficial for human cognition. The figure below shows that young adult Westerners and East Asians have comparable brain responses when processing visual stimuli consisting of objects and background scenes (adapted from Goh et al. (2007), Cogn. Affect. Behav. Neurosci., 7(1), 44-52). By contrast, older adult Westerners show object and scene processing responses, but older East Asians show scene processing responses with significantly reduced object processing regions engaged. 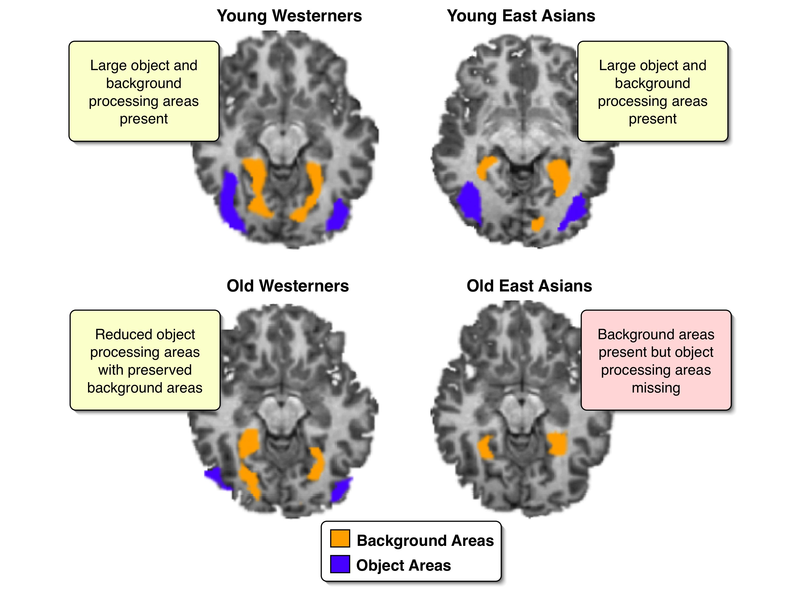 These findings suggest that culture-related bias for contextual processing may have accentuated background scene attention at the expense of object attention in older East Asians. This could possibly be due to age-related reduction in attentional resources for complete processing of the both aspects of the visual stimuli. In further support of culture-related effects on the brain, the figure below illustrates that, in younger adults, East Asians have thicker inferior temporal regions compared to Westerners (in blue) whereas Westerners have thicker frontal cortices than East Asians (in red) (adapted from Chee et al. (2011), J. Cogn. Neurosci., 23(5), 1065-1079). These culture-related differences in cortical thickness appear to be maintained in their older counterparts. Critically, this was only true for high-performing older adults. Culture-related differences were not observed for low-performing older adults. These findings suggest that experiential culture-related effects on brain structure were maintained in high-performing older adults but biological influences may have been more overwhelming for the low-performing individuals. Further work is necessary to determine the sources of these culture-related effects, the extent of their influence, and to identify key aspects of the different cognitive styles that may have bearing on age-related changes in brain structure and function. Gutchess, A. H.*, Goh, J. O. * (2013). Refining concepts and uncovering biological mechanisms for cultural neuroscience. Psychological Inquiry, 24, 1-6. Goh, J. O. S.*, Hebrank, A., Sutton, B., Chee, M., Sim, S., Park, D. (2011). Culture-related differences in default network activity during visuo-spatial judgments. Social, Cognitive, and Affective Neuroscience, 8(2), 134-142. Goh, J. O. S.*, Leshikar, E., Sutton, B. P., Tan, J. C., Sam, S., Hebrank, A., & Park, D. (2010). Culture differences in neural processing of faces and houses in ventral visual cortex. Social, Cognitive and Affective Neuroscience, 5(2-3), 227-235. Jenkins, L. J. *, Yang, Y. J., Goh, J., Hong, Y. Y., Park, D. C. (2010). Cultural differences in the lateral occipital complex while viewing incongruent scenes. Social, Cognitive and Affective, Neuroscience, 5(2-3), 236-241. Goh, J. O. S.*, Tan, J. C., Park, D. C. (2009). Culture modulates eye-movements to visual novelty. Public Library of Science ONE, 4(12), e8238. Goh, J. O. *, Park, D. C. (2009). Culture sculpts the perceptual brain. Progress in Brain Research, 178, 95-111. Sutton, B. *, Goh, J., Hebrank, A., Welsh, R. C., Chee, M. W. L., Park, D., (2008). Investigation and validation of intersite fMRI studies using the same imaging hardware. Journal of Magnetic Resonance Imaging, 28(1), 21-28.